Custom exhaust is built and we bring out the shine in RedTide's paint. 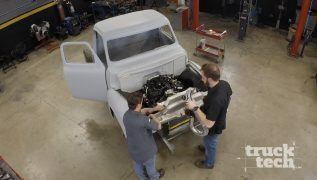 LT and Austin pull this new '65 C10 project off the rollback and take it for a test drive. 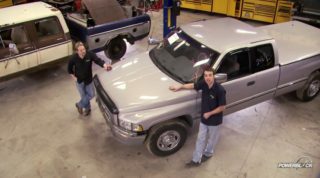 LT introduces Truck Tech's new host, Austin LeFort, to our '88 K1500 AWD Chevy. LT hoists the tired 350 from the engine compartment for a budget conscious 5.3L LS. 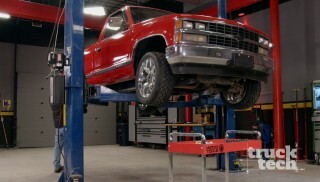 The 88 K1500 4WD gets slammed with a 4”-6” lowering kit. 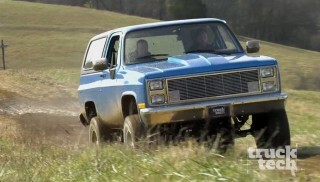 The supercharged big block Blazer hits the trails in search of a big mud hole. 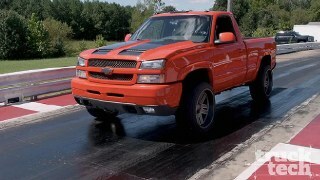 Judgement day for our Ram dually on both the dyno and dragstrip. Final top end mods, rear locker & traction bars installed before our 1 ton dually hits the strip. Ever wonder how a performance transmission can withstand 800 horsepower? We'll crack the case and show the inner workings. Plus, tradition meets 5000 HP at the granddaddy of all Tractor Pulls! '93 Chevy Silverado "Senior Silverado"
'04 Jeep Grand Cherokee "Tired Cherokee"
The NCM Insurance Agency is more than an insurance agency…as part of the National Corvette Museum, we are pleased to offer Corvette insurance, collector car insurance and car club insurance. (NARRATOR)>> IT'S JUDGEMENT DAY FOR OUR '74 F-100. WHAT DID $7,000 WORTH OF MODS BUY US? WE'LL FIND OUT BOTH ON THE DYNO AND ON THE RACE TRACK. THAT AND MORE RIGHT NOW ON TRUCK TECH. 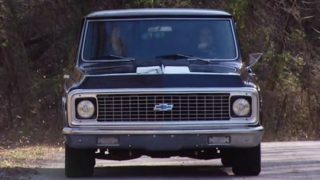 (JEREMY)>> TODAY IS FOR ALL YOU FORD GUYS OUT THERE BECAUSE WE'RE ABOUT TO SPEND A LITTLE QUALITY TIME WITH OUR 1974 F-100. (LT)>> NOW THE CHEVY C-10 HAS ITS LOVE IN THE AFTERMARKET, AND WE'VE BUILT OUR FARE SHARE OF THOSE, BUT LATELY THE F-100 IS JUST STARTING TO TAKE OFF IN TERMS OF POPULARITY, ESPECIALLY THE '70'S MODELS. NOW WE FIGURED WE'D JUMP IN AND SEE WHAT ALL THE FUSS IS ABOUT. (JEREMY)>> NOW THESE ARE REALLY GOOD LOOKING TRUCKS, ESPECIALLY IN A STANDARD CAB SHORT WHEEL BASE CONFIGURATION, AND WITH THIS TRUCK BEING A LITTLE BIT LOWER TO THE GROUND IT DEFINITELY GIVES IT THAT SPORT TRUCK LOOK. (LT)>> NOW A LITTLE BIT LATER ON WE'RE GONNA TEST IT OUT AND SEE HOW OUR SPORT TRUCK HANDLES, BUT FIRST LET'S TAKE A LOOK AT WHERE THIS BUILD BEGAN. (JEREMY)>> JUST UP THE ROAD FROM US IN COOKEVILLE, TENNESSEE, WE FOUND OUR '74 F-100 IN REALLY NICE SHAPE. 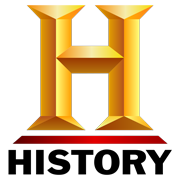 IN FACT IT HAD UNDERGONE A RESTORATION IN THE MID '90'S. SO IT WAS THE PERFECT CANDIDATE FOR A MILE BUILD. (LT)>> OTHER THAN A FEW BASIC SPEED PARTS UNDER THE HOOD THIS TRUCK IS AS STOCK AS IT GETS, AND BEFORE WE DID ANY WORK WE WANTED TO GET SOME BASELINE DATA ON HOW THE F-100 PERFORMS AS SHE SITS. SO WE HOOKED IT UP TO THE CHASSIS DYNO NEXT DOOR IN THE ENGINE POWER SHOP, WHERE THE 351 WINDSOR PUT DOWN AN UNIMPRESSIVE 146 HORSEPOWER TO THE WHEELS. (JEREMY)>> ...FOR THE TRUCK TECH PERFORMANCE TEST. THE RESULTS, ZERO TO 60 IN 11 SECONDS. BRAKING ABILITY, 60 TO ZERO IN 150 FEET. IN OUR MAKE SHIFT SLALOM COURSE THE TRUCK SHOWED MAJOR BODY ROLL RUNNING THROUGH THE CONES. THEN WE EACH TOOK IT FOR A LAP ON THE SHORT PART OF THE TRACK, WHERE IT AVERAGED A MINUTE-19 FOR A LAP. (LT)>> WITH OUR DATA IN HAND WE MADE A GAME PLAN TO TRANSFORM THIS TRUCK FOR A TOTAL OF $7,000 DOLLARS IN PARTS. WE STARTED WITH THE SUSPENSION AND LOWERED IT FOUR INCHES WITH SOME BOLT ON SHACKLES AND HANGERS OUT BACK, AND NEW IBEAMS IN THE FRONT. AND WE STIFFENED UP THE SUSPENSION WITH NEW ANTI ROLL BARS FRONT AND REAR. (JEREMY)>> NEXT, TO GIVE THE TRUCK SOME HELP GETTING OFF THE LINE WE TORE APART THE REAR NINE INCH TO GIVE IT SOME NEW 3.89 GEARS, AND A DETROIT TRUE TRACK WAS INSTALLED TO PUT THE POWER DOWN TO BOTH WHEELS. (LT)>> THEN WE SPENT THE MAJORITY OF OUR BUDGET BY TEARING THE 351 WINDSOR DOWN TO A BARE SHORT BLOCK AND TOPPING IT OFF WITH A NEW CAM, A PAIR OF EDELBROCK 195cc CYLINDER HEADS, AN ALUMINUM AIR GAP INTAKE, AND A LARGER CARB. (JEREMY)>> SO WHAT DID ALL THIS WORK BUY US? WELL EVERYTHING WE DID HERE WAS A SIMPLE BOLT ON INSTALLATION REQUIRING NO SPECIAL TOOLS, AND INDIVIDUALLY THESE JOBS CAN BE ACCOMPLISHED IN A WEEKEND, AND WE DIDN'T HURT ANYTHING. SO IF WE EVER DECIDED TO CONVERT THIS TRUCK BACK TO STOCK WE COULD DO THAT PRETTY EASILY. SO WE WOUND UP WITH A GOOD LOOKING, SPORTY CLASSIC TRUCK. SHOULD BE A LOT OF FUN TO DRIVE, AND HOPEFULLY DO A LOT BETTER OUT ON THE RACE TRACK, BUT THE BIG QUESTION IS, HOW DID SHE DO ON POWER? WELL WE COULDN'T RESIST. WE HAD TO THROW IT ON THE DYNO TO FIND OUT. (LT)>> ALL RIGHT FELLAS, THIS IS LIKE THE MOMENT OF TRUTH RIGHT? (PAT)>> WELL I'M GLAD I'M HERE BECAUSE I WOULDN'T BE ABLE TO SLEEP IF I DIDN'T KNOW WHERE THE CAM WAS. (LT)>> AND YOU DEGREED THE CAM. (PAT)>> AND I DEGREED IT. SO I DON'T KNOW IF IT'S GONNA BE GOOD, BAD? IT'LL BE GOOD! (LT)>> WELL I GUESS HERE'S WHERE WE FIND OUT IF ALL THAT MONEY WE SPENT WAS WORTH IT OR NOT RIGHT? (PAT)>> I THINK YOU'RE GONNA BE QUITE PLEASED. 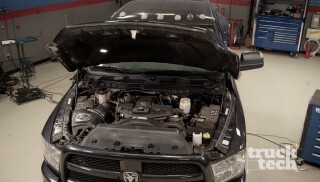 IT'S NEVER A GOOD IDEA TO GIVE YOUR ENGINE FULL POWER UNTIL IT'S WARMED UP. SO WE'LL MAKE A FEW EASY PASSES TO GET THE ENGINE OIL, TRANSMISSION, AND THE REAR DIFFERENTIAL UP TO TEMPERATURE. ALL RIGHT, 230. THAT'S NOT BAD. (JEREMY)>> THAT'S A BIG GAIN OVER WHAT WE HAD. (LT)>> THEN WE'LL HIT IT A FEW TIMES, SEE WHAT SHE PUTS DOWN. (JEREMY)>> MAN YEAH, THAT'S WHAT I'M TALKING ABOUT. (LT)>> 261 POUNDS OF TORQUE. (LT)>> YEAH MAN, CHECK THIS OUT. LOOK AT THESE GAINS WAY UP HERE. (LT)>> ABSOLUTELY, YOU KNOW WE WENT FROM 79 HORSEPOWER ON OUR OLD SETUP TO 234 HORSEPOWER AT THE SAME EXACT RPM. THAT IS HUGE! (PAT)>> THAT IS AN IMMENSE GAIN THAT YOU WILL FEEL. LOOK AT THE TORQUE DIFFERENCE, LET ALONE THE HORSEPOWER. THIS THING'S GONNA PULL LIKE A MONSTER COMPARED TO WHAT IT WAS. (JEREMY)>> HEY, I'M HAPPY! YOU HAPPY? (NARRATOR)>> UP NEXT, TOWING BASICS AND LATER, TRACK TIME! (JEREMY)>> NOW ONE MAJOR REASON PEOPLE BUY PICK UP TRUCKS IS FOR THEIR HAULING CAPACITY. IT SEEMS THERE IS ALWAYS SOMETHING THAT NEEDS TO BE MOVED AROUND. SO THE BED OF A TRUCK, OR A TRAILER, IS A GREAT THING TO HAVE. (LT)>> BUT IT CAN BE A BIT CONFUSING WHEN IT COMES TO UNDERSTANDING HOW MUCH WEIGHT YOUR TRUCK IS ACTUALLY RATED TO CARRY, HOW BIG OF A TRAILER YOU CAN SAFELY HAUL, AND WHERE YOU SHOULD POSITION THE WEIGHT OF THE CARGO IN THE TRUCK OR THE TRAILER. (JEREMY)>> AND TODAY, AS WE GET READY TO TOW OUR F-100 TO THE TRACK, WE'LL GO OVER SOME OF THE BASICS OF TOWING, HAULING, WEIGHT RATINGS, AND HOW TO PROPERLY STRAP DOWN YOUR CARGO. (LT)>> WE'LL START WITH THE BASICS, AND THAT'S GVWR, OR GROSS VEHICLE WEIGHT RATING. THIS IS A FIGURE THAT YOU'LL ALWAYS FIND PUBLISHED ON A STICKER ON THE DOOR JAM. OUR TRUCK IS RATED AT 14,000 POUNDS. THAT'S QUITE A BIT, BUT THE MISTAKE I SEE PEOPLE OFTEN MAKE IS THINKING THAT MEANS YOU CAN ADD 14,000 POUNDS OF STUFF TO THIS TRUCK, AND THAT'S JUST NOT TRUE BECAUSE THE "G" STANDS FOR GROSS OR TOTAL. SO WE HAVE TO CONSIDER THE WEIGHT OF THE TRUCK WHEN WE'RE MAKING OUR CALCULATIONS. THIS RIG WEIGHS ABOUT 8,500 POUNDS. SO WE HAVE TO SUBTRACT THAT FROM THE 14,000 POUND RATING, WHICH LEAVES US ABOUT 5,500 POUNDS OF STUFF WE CAN PUT IN OR ON THE BACK OF THIS TRUCK. ALSO DON'T FORGET, YOU HAVE TO CONSIDER HEAVY THINGS YOU BOLT ONTO THE TRUCK, LIKE BIG OFF ROAD BUMPERS OR WINCHES. THOSE WILL ACTUALLY SUBTRACT JUST A LITTLE BIT FROM THE GVWR. (JEREMY)>> THE NEXT THING WE NEED TO TALK ABOUT IS GROSS COMBINED WEIGHT RATING, OR GCWR. NOW THIS IS THE RATING OF THE TRUCK, THE TRAILER, AND ANYTHING YOU PUT ON THE TRAILER OR THE TRUCK. NOW ACCORDING TO RAM OUR TRUCK IN THIS CONFIGURATION HAS A GCWR OF 29,300 POUNDS, BUT REMEMBER THAT'S GROSS. SO SUBTRACT THE WEIGHT OF THE TRUCK AND THAT MEANS OUR RAM CAN PULL 20,800 POUNDS, WHICH IS A TON OF WEIGHT, OR MORE LIKE 10 TONS. (JEREMY)>> I'LL POP THE FACTORY COVER OUT, RAISE THE TAB ON TOP OF THE BALL, AND ROTATE IT A QUARTER TURN, HOLDING THE BALL SECURELY IN ITS MOUNT. THE SAFETY CHAIN ANCHORS ALSO HAVE A PROVISION TO MOUNT IN THE FRAME. JUST PULL THE SAFETY PIN AND LOCKING PIN OUT, DROP THE ANCHOR IN, AND TURN. REINSTALL THE LOCK PIN AND THE SAFETY PIN, AND IT'S THE SAME THING ON THE OPPOSITE SIDE. NEXT WE CAN BACK UP THE RAM AND CRANK DOWN THE HANDLE TO LOWER THE TRAILER UNTIL THE COUPLER IS FULLY SEATED ON THE BALL. LOCK THE COUPLER DOWN, ATTACH THE SAFETY CHAIN, AND PLUG IN THE TRAILER TO THE TRUCK. THEN CLOSE THE TAILGATE AND FULLY RAISE THE JACKS. (JEREMY)>> ALL RIGHT, THE FIRST THING I WANT TO MAKE SURE OF WHEN I GET A TRUCK ON THE TRAILER IS THAT WE HAVE ABOUT 60 PERCENT OF THE WEIGHT AHEAD OF THE AXLE. SO SINCE ALL OF THE WEIGHT'S IN THE ENGINE COMPARTMENT WE JUST WANT TO PULL A LITTLE BIT AHEAD OF THE AXLES AND WE'RE GOOD TO GO THERE. ANOTHER THING I WANT TO LOOK FOR IS WE MAKE SURE THE TRUCK IS EVEN SIDE TO SIDE ON THE TRAILER. THIS IS GONNA MAKE SURE THE WEIGHT IS CENTERED ON THE TRAILER AND IT'S NOT UNLEVEL OR UNBALANCED ON US. (LT)>> WE'RE BACK ON TRUCK TECH, BACK AT THE SAME TRACK WE GOT OUR BASELINE AT ON OUR F-100, NCM MOTORSPORTS PARK IN BOWLING GREEN, KENTUCKY. (JEREMY)>> THIS 200 ACRE FACILITY IS ADJACENT TO THE NATIONAL CORVETTE MUSEUM, AND HAS FOUR MILES OF PAVEMENT IN FOUR TRACK CONFIGURATIONS. LAST TIME WE RAND THE ONE POINT ONE MILE TECHNICAL LOOP. PLENTY OF ROOM TO FLY OUR FORD. NOW REMEMBER, WE DID NOT BUILD A FULL BLOWN RACE TRUCK. WE BUILT A TRUCK THAT WE COULD TAKE OUT, CRUISE ON THE WEEKENDS, BUT WE COULD ALSO BRING IT TO THE TRACK IF WE WANTED TO, AND REMEMBER, THIS IS A BUDGET BUILD. SO WE DON'T HAVE A LOT OF MONEY INVESTED IN THIS TRUCK. (LT)>> YEAH, WE'RE REALLY NOT TRYING TO CHASE THE ULTIMATE LAP TIME HERE, BUT WHEN WE DO UPGRADES TO THE SUSPENSION, AND THE PERFORMANCE, AND THE HANDLING WE REALLY SHOULDN'T TEST THOSE THINGS OUT ON PUBLIC STREET. SO TO THE RACE TRACK IT IS. (JEREMY)>> LET'S GET AT IT. YOU HAVE SOMETHING TO HOLD ONTO OVER THERE? (LT)>> NO, NOTHING AT ALL. (JEREMY)>> THIS IS GONNA BE FUN THEN. (LT)>> NO, NOT FOR ME. (JEREMY)>> YOU KNOW, I LIKE HOW YOU LET ME DRIVE AND I DON'T HAVE TO SIT OVER THERE. (LT)>> WELL YOU'LL GET YOUR TURN. (JEREMY)>> I'M NOT RIDING WITH YOU. (LT)>> COME ON MAN, THIS IS JUST AN EASY LAP! (JEREMY)>> IS THIS NOT EASY? (LT)>> NOT WHEN YOU'RE SITTING ON A BENCH SEAT. (JEREMY)>> OH I CAN TELL RIGHT AWAY THE POWER. ...YOU CAN FEEL IT PULL NOW. (LT)>> I MEAN REALLY MY FAVORITE THING ABOUT THIS TRUCK IS IT IS A BUDGET SETUP. SO, YOU SAID IT BEFORE, I'LL SAY IT AGAIN. THIS TRUCK IS NOT MEANT TO BE OUT ON A ROAD COURSE, BUT LOOK HOW MUCH FUN WE'RE HAVING. (JEREMY)>> IT'S A LOT OF FUN. (LT)>> WE'VE GOT NEXT TO NO MONEY IN THIS TRUCK. YOU KNOW WE PROBABLY SHOULD HAVE INVESTED IN A PROPER PAIR OF RACE SEATS, ESPECIALLY FOR THIS SIDE. (LT)>> WHAT ARE YOU DOING? (LT)>> SO WHAT'S YOU INITIAL IMPRESSION COMPARED TO LAST TIME? IT STILL ROLLS A LITTLE BIT, BUT I THINK WE MADE A PRETTY GOOD IMPROVEMENT. (JEREMY)>> WELL OUT HERE ON THE ROAD COURSE I CAN ACTUALLY, BEHIND THE WHEEL, TELL A BIG DIFFERENCE. THERE'S NOT NEAR AS MUCH BODY ROLL. I'M ABLE TO GET INTO THE CORNER A LOT QUICKER THAN I WAS BEFORE, AND THEN I'M ABLE TO GET OUT OF IT A LOT QUICKER DUE TO THE POWER WE HAVE NOW. SO ALL IN ALL I THINK IT'S A GREAT IMPROVEMENT. YOU KNOW, IT'D BE NICE TO HAVE 800 HORSEPOWER RIGHT NOW. (LT)>> THAT'D BE A LITTLE BIT MUCH HONESTLY. I WOULDN'T WANT TO ADD A WHOLE LOT MORE POWER. WE'D HAVE TO COMPLETELY REDESIGN THIS THING, BUT AGAIN, IT'S ALL ABOUT FUN. BEFORE JEREMY AND I ATTEMPT OUR SOLO TIMED RUNS WE DROVE OVER TO THE PADDOCK AREA FOR SOME ADDITIONAL TESTING. OUR LAST ZERO TO 60 TIME WAS 11.08 SECONDS BEFORE OUR ENGINE MODS. THIS SHOULD BE MUCH QUICKER. (LT)>> LITTLE WHEEL SPIN, NOT BAD! ALL RIGHT, THREE, TWO, ONE, 60! (JEREMY)>> I'D SAY THAT'S MUCH BETTER. THAT WAS 7.45. (JEREMY)>> SO WE'VE IMPROVED THAT A LOT. (NARRATOR)>> AHEAD, REDEMPTION FOR WHAT WAS A WORN OUT WINDSOR! (LT)>> IF YOU HAVE A CLASSIC OR COLLECTOR VEHICLE, YOU KNOW HOW HARD IT CAN BE TO GET AN INSURANCE POLICY THAT'LL MEET YOUR NEEDS, AND IF YOU TAKE A CAR OUT TO A TRACK AND WRECK IT MOST OTHER AUTO INSURANCE COMPANIES WON'T COVER YOU. NCM INSURANCE OFFERS A WIDE RANGE OF COVERAGE OPTIONS FOR CLASSIC OR COLLECTOR VEHICLE. PLUS IF YOU COME OUT TO A HIGH PERFORMANCE DRIVING SCHOOL AT A TRACK YOU CAN GET COVERAGE FOR THAT AS WELL. 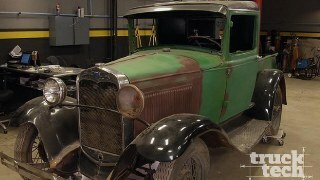 (JEREMY)>> AND ONE VERY UNIQUE THING ABOUT NCM INSURANCE THAT I REALLY LOVER IS THEY'LL ACTUALLY COVER YOUR OLD PROJECT OR HOT ROD WHILE IT'S UNDERGOING A RESTORATION. SO TO FIND OUT MORE ABOUT THEM OR TO GET A QUOTE CHECK OUT NCM INSURANCE DOT COM. IT'S TRACK DAY. WITH A FEW MORE RUNS IN THE F-100 LEFT TO JUSTIFY OUR $7,000 BUDGET. PREBUILD, THE FORD SHOWED MAJOR BODY ROLL WITH HANDLING THE CONES. I THINK IT'S GONNA DO BETTER. (LT)>> IT CAN'T DO WORSE RIGHT? (LT)>> IT'S MUCH, MUCH FLATTER THAN BEFORE, THAT'S FOR SURE. (JEREMY)>> WHAT I NOTICED RIGHT OUT THE GATE IS BEFORE I FELT LIKE I COULD REACH OUT THE WINDOW AND TOUCH THE PAVEMENT, AND NOW, NOW IT'S STAYING PRETTY FLAT. (JEREMY)>> ALL RIGHT, NOW WHEN I'M DRIVING A COURSE LIKE THIS, EVEN THOUGH THERE'S A LOT OF TURNS, ONE THING I WANT TO DO, WHICH SOUNDS CRAZY, IS GO STRAIGHT AS POSSIBLE. SO I WANT TO FIND THE STRAIGHTEST ROUTE THROUGH ALL OF THE TURNS, AND MAKE SURE I HIT ALL OF MY APEXES. SO I'LL STAY WIDE, AND AS I COME INTO A TURN LIKE THIS, THEN I START TO HUG INTO THE APEX. AS I START TO COME BACK OUT TO ANOTHER CORNER I'LL DRIFT TO THE OUTSIDE, AND THEN THAT'S MY QUICKEST LINE IN. (LT)>> SINCE THE CAM PHASER IS THE MOST FAILURE PRONE PART ON A THREE VALVE, IT'S BEEN REPLACED BY THE MOST CURRENT REVISION OF AN OE LEVEL PART. PLUS EVERYTHING ELSE UNDER THE CAM COVER IS BRAND NEW. FROM THE UPDATED CHAIN TENSIONERS, THE PLASTIC CHAIN GUIDE, AND OF COURSE THE TIMING CHAIN ITSELF. 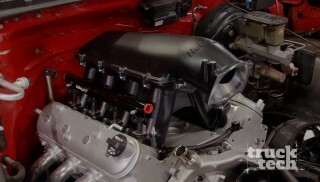 ALSO THERE'S A NEW MELLING OIL PUMP THAT'LL IMPROVE OIL FLOW TO THE TOP END OF THE ENGINE. 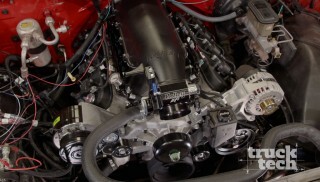 TO KEEP YOUR F-150 ON THE ROAD BE SURE TO CHECK OUT POWERTRAIN PRODUCTS DOT NET. THEY OFFER REMANUFACTURED ENGINES, TRANSMISSIONS, TRANSFER CASES, AND DIFFERENTIALS FOR A WIDE RANGE OF VEHICLES. THEY HAVE A GREAT WARRANTY, AND YOU CAN EVEN STEP UP TO THE NO FAULT WARRANTY THAT'LL COVER YOU FOR FIVE YEARS AND UNLIMITED MILES, REGARDLESS OF THE CAUSE OF FAILURE. (JEREMY)>> WE ALL KNOW THAT HEAT IS ONE OF YOU ENGINE'S BIGGEST ENEMIES, BUT BROTHERS TRUCKS HAS WHAT YOU NEED TO KEEP YOUR '73 THROUGH '87 CHEVY'S ENGINE COOL AND HAPPY, STARTING WITH THIS ALL ALUMINUM FOUR ROW RADIATOR THAT COMES STANDARD WITH THE TRANSMISSION COOLER. THEN TO IMPROVE AIR FLOW BROTHERS ALSO OFFERS A FAN SHROUD KIT THAT WORKS WITH THIS RADIATOR. IT INCLUDES THE SHROUD, TWO 14 INCH ELECTRIC FANS, AND THE WIRING HARNESS. SO FOR YOUR COOLING NEEDS AND MUCH MORE CHECK OUT BROTHERS TRUCKS DOT COM. (LT)>> ALL RIGHT MAN, SO HOW DID WE DO ON OUR $7,000 DOLLAR BUDGET TRACK TRUCK? (JEREMY)>> YOU'VE GOT TO SAY IT'S A LOT OF FUN NOW. IT MAY NOT STILL BE THE FASTEST THING IN THE WORLD, BUT SHE'S A TON OF FUN OUT HERE. (LT)>> ALL RIGHT, WELL LET'S GET TO IT. WHAT DID I DO? (JEREMY)>> WELL YOU DID A 1:13:13. (LT)>> OKAY, WELL THE GOOD NEWS IS THAT'S PROBABLY SIX SECONDS QUICKER THAN LAST TIME. THE BAD NEWS IS YOU DID A 1:11:29. (JEREMY)>> SO I BEAT YOU AGAIN. (LT)>> YEAH BUT I GOT THE STYLE POINTS. (JEREMY)>> SO IN ALL WHAT'S THAT? SEVEN OR EIGHT SECOND DIFFERENCE THAN LAST TIME? (LT)>> YOU KNOW WHAT, ON A RACE TRACK, THAT'S ACTUALLY A REALLY BIG DIFFERENCE. IF YOU GUYS WANT ANY MORE INFORMATION ON THIS TRUCK OR ANY OTHER VEHICLE THAT WE BUILD ON POWERNATION BE SURE TO CHECK OUT POWERNATION TV DOT COM.